It shouldn’t work. Who really wants to watch a film about a man who’s making a night drive to London in his BMW? Wouldn’t such a film feel claustrophobic and limited or, even worse, become a cinematic experiment conducted by a director intent on proving he can sustain interest within such narrow parameters? Fortunately, Locke is neither pot-bound nor experimental: It’s a brilliant character study of a man in the midst of a terrible personal crisis. Tom Hardy, the spectacularly good British actor who made Bronson so riveting, proves equally compelling in Locke — albeit in a lower-key way. Hardy plays Ian Locke, a construction supervisor who’s abandoning the biggest project of his life to make this trip. The movie takes place on the eve of a massive concrete pour, the biggest ever in Europe aside from those associated with nuclear or military facilities. Locke is a detail-oriented man of patience, practicality and, above all, reliability. It’s killing him to turn his back on his job, but he believes he has no other choice. 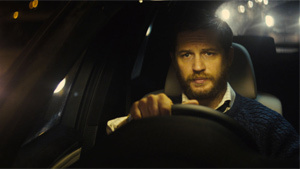 As he drives, Locke receives phone calls — from a colleague on the job who must take over for him, from one of his sons, from his wife and from the person in London he’s driving to see. We never see any of them; these characters make themselves known to us only through their voices, and by Locke’s reaction to what they say. The situation in which Locke finds himself is emotionally explosive, but Locke isn’t: He’s accustomed to seeking practical solutions to problems. He’s prone to think that his professional skill set can be applied to any situation. The character’s name is worthy of consideration. John Locke, of course, was the English philosopher devoted to empiricism and reason: It’s Ivan Locke’s fate to confront a problem that doesn’t lend itself to calm consideration. Between phone calls, Locke talks to his dead father, the ghost of whom he envisions riding in the backseat. This device works only fitfully, but director Steven Knight — who wrote the screenplays for Dirty Pretty Things, Eastern Promises, Close Circuit and Amazing Grace — uses it to round out Locke’s character. Cinematographer Harris Zambarloukos (Thor) does an amazing job of bringing visual interest to a film that could have been fatally uncinematic. All of this makes Locke a rarity: a small movie with a big impact. If Locke is a road movie, it’s a road movie like no other: It cares more about what’s happening inside the car than out.